GRO Indexes to Births, 1837 to date, "Jun qtr 1842. Sachett, Alfred. Mother: Farley. Thanet. 5:437." Baptisms Register, St George, Ramsgate (Transcript), "29 May 1842 Alfred s. Jeremiah & Dinah Sackett, Ramsgate, gardener." GRO Indexes to Deaths, 1837 to date (National Archives), "Jun qtr 1931. Sackett, Alfred, 88. Newton A." 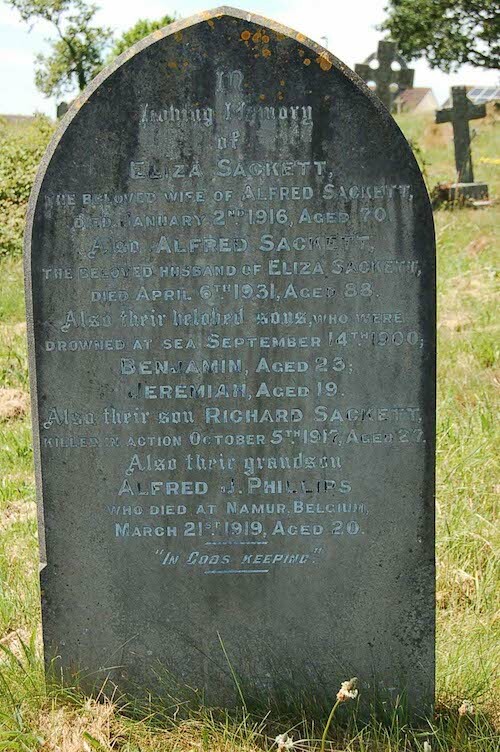 Website Find A Grave (http://www.findagrave.com), "In Loving Memory of Eliza Sackett, the beloved wife of Alfred Sackett, died January 2nd 1916, aged 70. Also Alfred Sackett, the beloved husband of Eliza Sackett, died April 6th 1931, aged 88. Also their beloved sons, who were drowned at sea September 14th 1900; Benjamin, aged 23; Jeremiah, aged 19. Also their son Richard Sackett, killed in action October 5th 1917, aged 27. Also their grandson Alfred J Phillips who died at Namur, Belgium, March 21st 1919, aged 20. In God's keeping." Census records give wife's name, Eliza. A marriage record has not been found. GRO Indexes to Deaths, 1837 to date (National Archives), "Mar qtr 1916. Sackett, Eliza, 70. Newton Abbot." Kate Sackett, dau, 15 months, b. Teignmouth. Bella Sackett, dau, 1, b. Teignmouth. Richard Sackett, son, 12, b. Teignmouth.